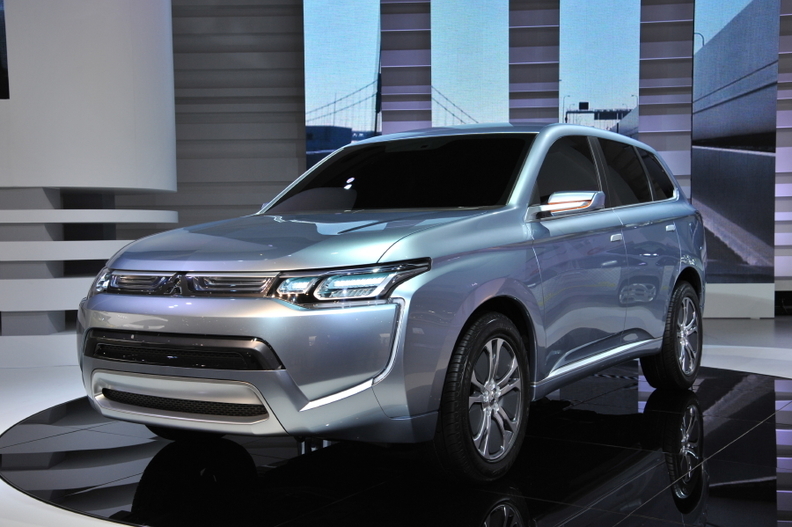 Mitsubishi showed off its less aggressive face on the PX-MiEV concept, which is a plug-in hybrid variant of the Outlander compact SUV. TOKYO – Mitsubishi Motors Corp. will replace its aggressive "jet-fighter" grille with a more "friendly" face as its tries to recast itself as a green-car specialist. The Japanese automaker wants to use a range of full-electric cars and plug-in hybrids to halve its average global CO2 emissions by 2020, using 2005 as a baseline. Mitsubishi declined to reveal its 2005 global figure but in 2007 its CO2 average in Europe was 170 grams per kilometer. By 2015, automakers must reduce CO2 emissions from new cars sold in Europe to a fleet average of 130g/km. Last year's average was 140.9g/km, down from 145.9g/km in 2009, according to JATO Dynamics's analysis of 21 European markets. "Up until now Mitsubishi has focused on driveablility, sports mobility and SUV development," general design manager Hiroaki Ohtsuka told Automotive News Europe earlier this month at the Tokyo auto show. "That showed in our design, but now we are shifting focus to a more environmental aspect. From the jet-fighter look, we are moving to a more friendly looking grille." The firm's jet-fighter grille was first seen on the Lancer-based Evo X, launched in Europe in 2008. 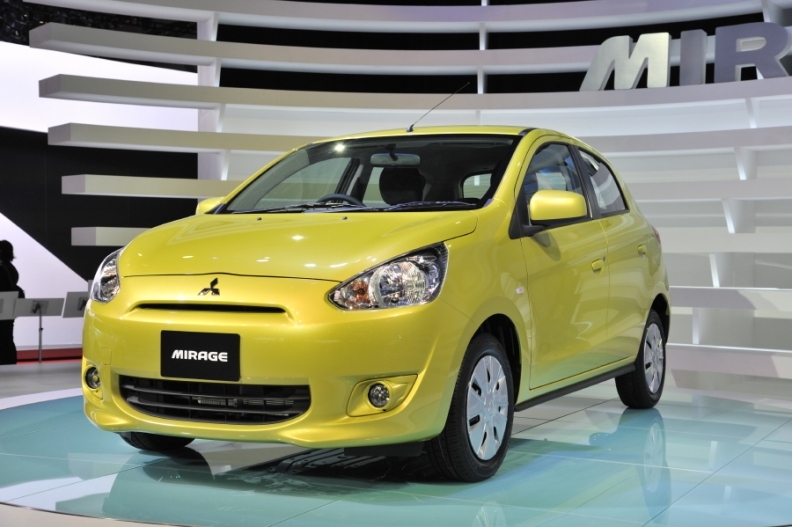 A gasoline-powered version of the Mirage is due in Europe in early 2013. Mitsubishi's pending design change was previewed by two models at the show– a gasoline-powered Mirage subcompact, which is due in Europe in early 2013 and expected to have CO2 emissions of 95g/km, and the PX-MiEV, a plug-in hybrid concept of the Outlander compact SUV. Driven in mule form by Automotive News Europe, the PX-MiEV, has an electric-only range of 50km (30 miles). The plug-in hybrid, which will go on sale alongside the rest of the Outlander's new range in 2013, is expected to have CO2 emissions of 50g/km. The new Outlander lineup will be proceeded by a plug-in hybrid variant of the ASX small SUV, which Mitsubishi said would have a electric-only range of less than 50km. The company declined to be more specific. Mitsubishi also is mulling an full-electric Mirage. The automaker wants electric vehicles and plug-in hybrids to account for 20 percent of global sales by 2020. One European importer expects buyers here to be more focused on plug-in hybrids than full electric cars. "We think there's much more opportunity for that than pure electric cars," Lance Bradley, managing director of UK importer the Colt Car Company, told Automotive News Europe. "The EV market isn't as big as anyone though it was going to be," he said in reference to UK sales. One factor that turns customers away from electric vehicles is their high price, which is due mostly to the battery. It's is a problem that Mitsubishi Motors Europe CEO Akinori Nakanishi believes will disappear. "Battery costs will have fallen by 30 percent three years from now," he said. In October, Mitsubishi announced it will build a second battery factory with partner GS Yuasa in Japan.